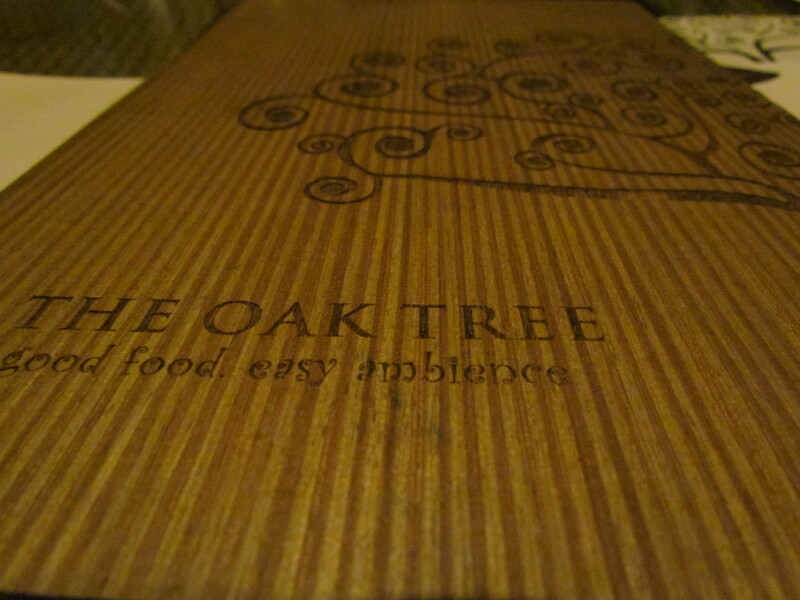 Nice Ambience, nice people, some outstanding food & some other ‘just OK’ food. It’s a small cozy restaurant in Supermart besides the super popular Needs Supermarket. The ambience is nice. The ceilings have metal beams thus giving a retro look. There is a tiny bar area that looks smart. 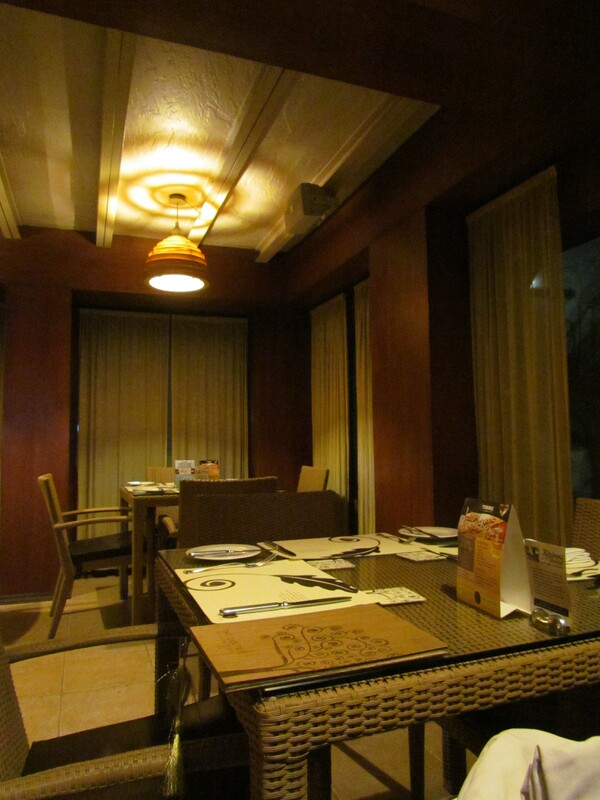 There are sofas in lounge style on one side & normal restaurant seating on the other. Due to lack of space, the seats are a bit near to each other but not disturbingly near. They were playing a peppy piped music that was enjoyable but non intrusive. We cud talk. The members of Staff were very warm,polite, helpful & knowledgeable. In fact, the waiting staff noticed that we did not finish one of the meals. So he asked us ‘did u not like it’ we said ‘yes’. Immediately after that the Chef walked up to us to discuss what was wrong. We tried a fondue that had great accompaniments but the cheese dip was too runny. An outstanding Bratwurst sausage & an interesting Italian Prawn preparation that was tasted good but had major issues in texture. The mead ‘drink’ that we had was very ordinary. They make some good stone oven thin crust Pizzas as well, both vegetarian & Nonvegetarian. 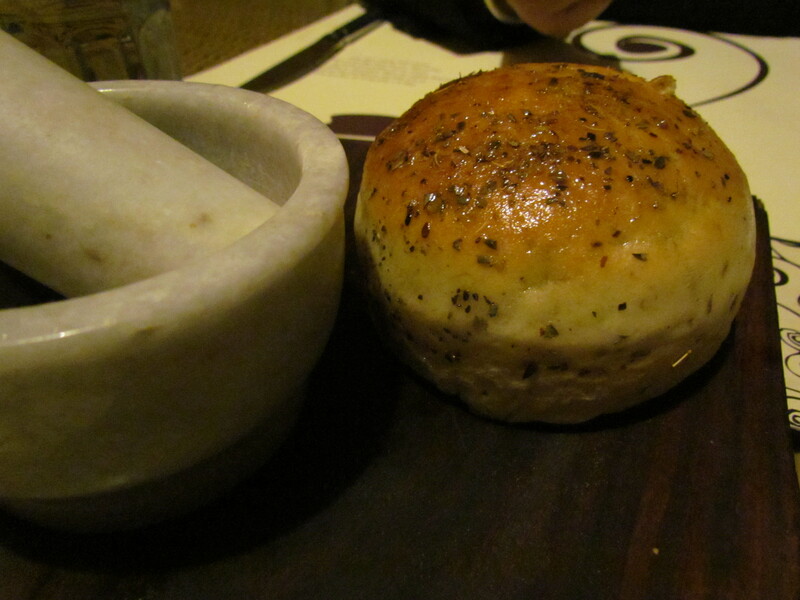 Before the main dishes arrived, we were served a super soft freshly baked bread. This was accompanied with fried onions, tomatoes, olive, basil herbs, served in a stone bowl. We muddled this mixture ourselves with a stone muddler that was provided. Loved the experience & the superb taste. This was ‘on the house’. 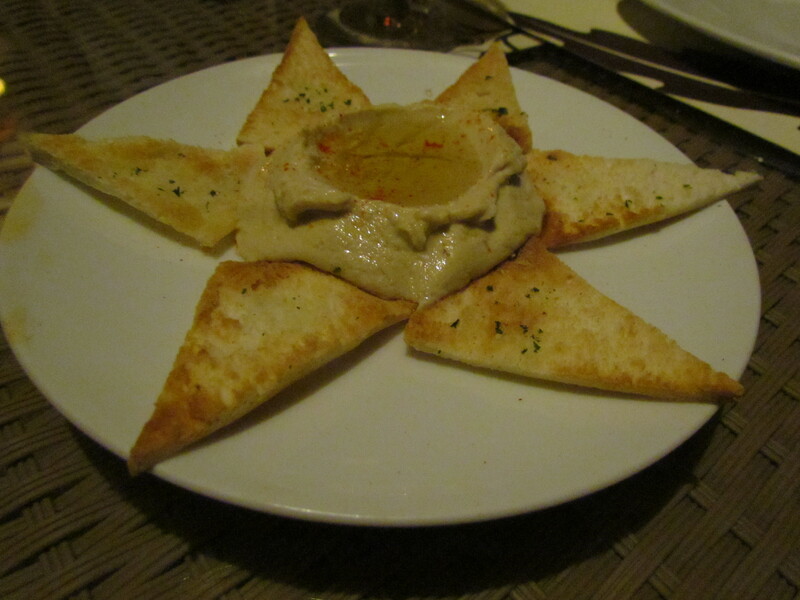 Crackers & hummus was also served on the house. Excellent crackers & a good hummus paste I wud say. 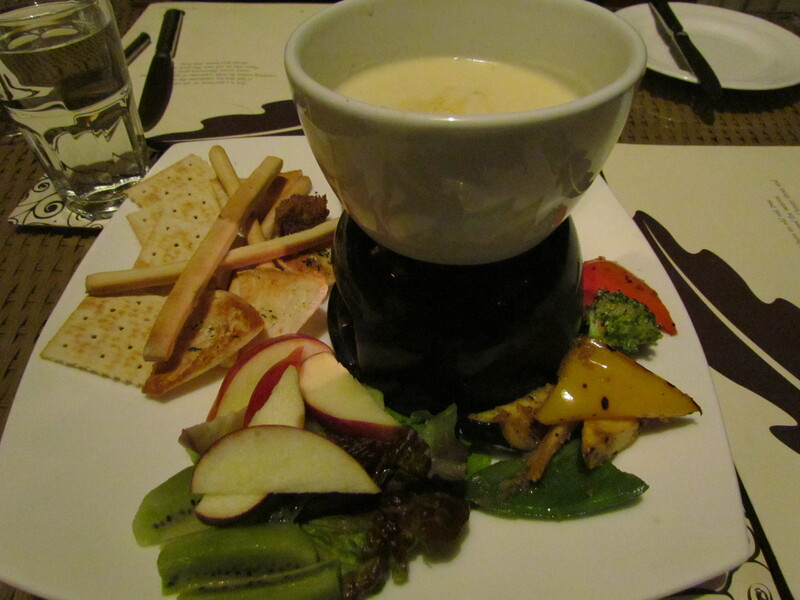 Then came the first dish that we ordered – Classic Gruyere & Emmenthaler Cheese fondue. 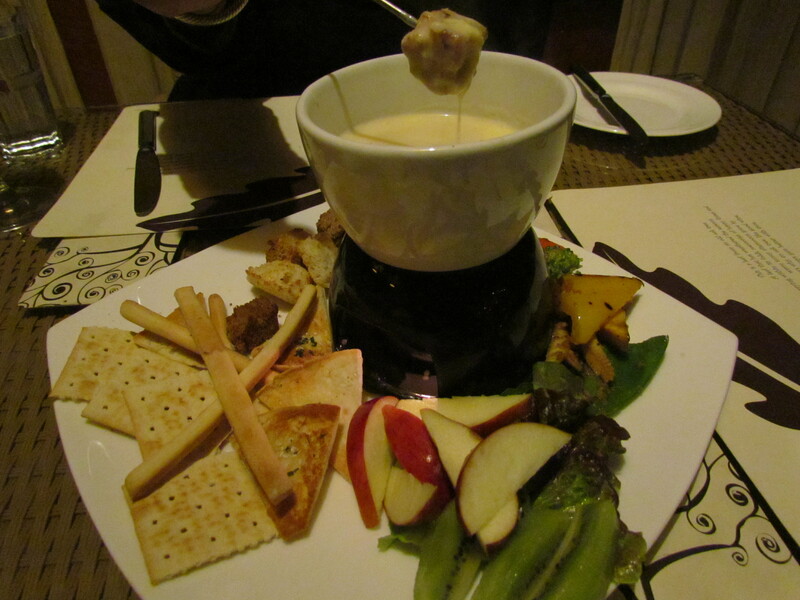 For the uninitiated, fondue is a cheesy dip that is served on a flame along with different kinds of food items. The food items are dipped in the cheesy dip & eaten. Here they gave us lots of things to dip – thinly sliced apples, kiwi, bread sticks, crispy crackers, crunchy & tasty bread croutons & some cool bell peppers sautéed in garlic. With all those good stuff what turned out to be bad was the dip itself. It was runny – So when u dip something in it, the dip wud not hold & fall off. So if u dip an apple, the sauce would fall off till it reaches ur mouth & hence u get to eat an apple with a mild cheesy flavor. I am not sure if anyone else has encountered this as well but the chef told us that it was by accident. Post the ‘not good’ experience came a dish that bowled us over. 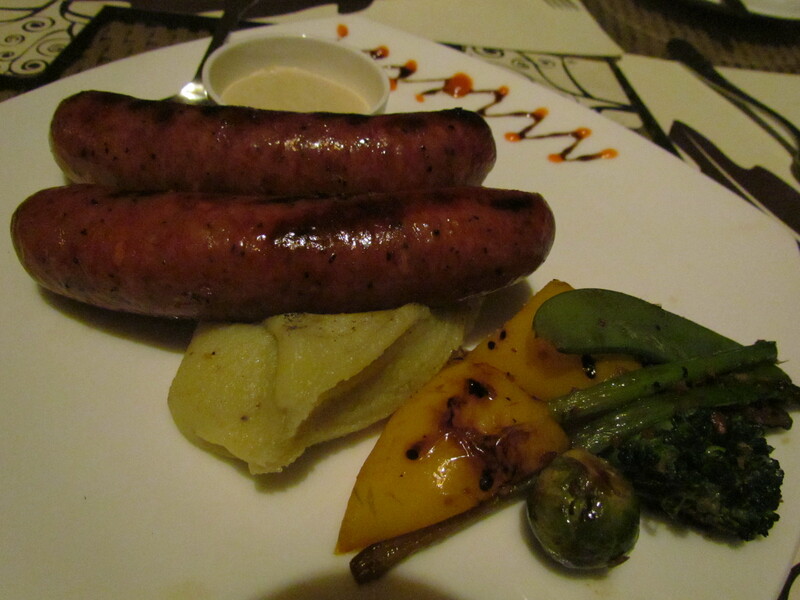 Bratwurst sausages with grilled vegetables, mashed potatoes & horseradish sauce. This is something that u do not always get easily in Delhi in non 5 star eateries. We were impressed that this was served in the first place & was over impressed with the taste of the same. The sausage was unbelievably tasty & good, super juicy – oozing out with every incision with the knife – The knife was blunt I must mention. It was not the kind that u r provided when u r having a meat dish. The sausage has a thick cover & when I pressed the knife on it, it wud not cut till I really pressed hard or started sawing it real long. The sautéed vegetables were tasty, crisp & smart. The mashed potato had butter & garlic in it, thus making it tasty, smooth & enjoyable. 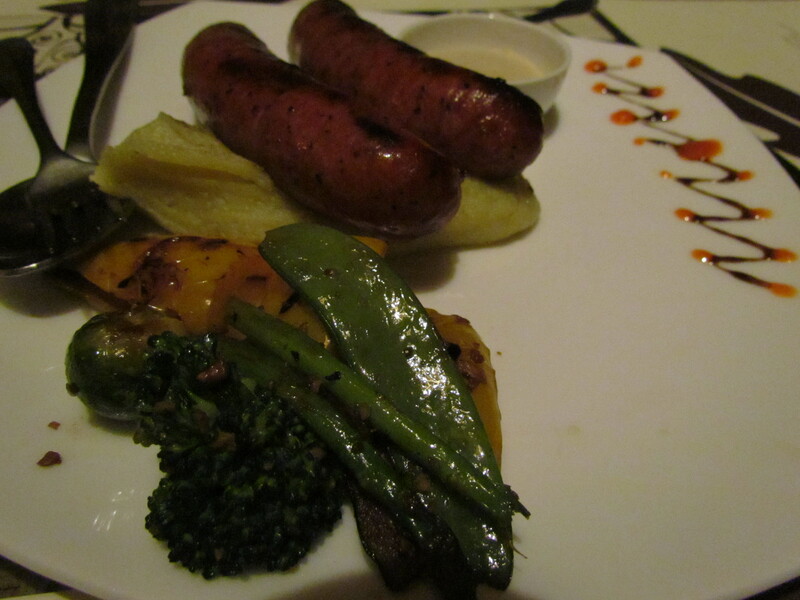 Very impressed with the sausage we decided to skip dessert & try another dish. So we went for Wood fire sizzling gambas (prawns) bubbled in olive oil. 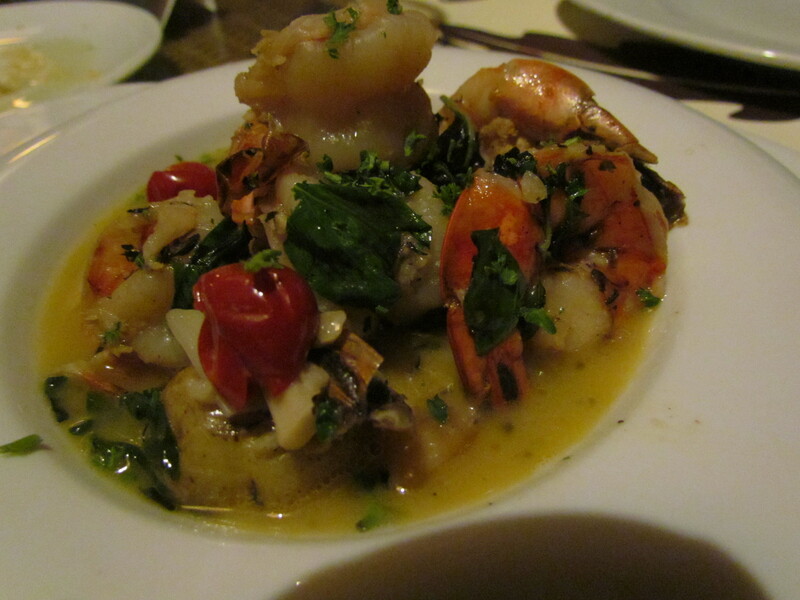 According to the menu card, it had ‘garlic, lemon, lots of goodness, true grandma’s recipe from Calabria Italy’. As the food was served, we were impressed by the look. It had a thin gravy that was very flavorful & quite tasty. However, the prawns were extraordinarility stiff & chewy. At Rs. 625, this was a letdown overall. To wash this down we tried Mead. For the uninitiated, according to Wiki, Mead is an alcoholic beverage that is produced by fermenting a solution of honey and water. Some producers have marketed white wine sweetened and flavored with honey after fermentation as mead. What was served to us was white wine with dry herbs & fresh fruit served hot. While ordering we thought that it wud b as good as German mulled wine but it turned out to be very average – It was just wine & fruits microwaved together (mulled wine is made by heating on fire & removing the same before boiling point). 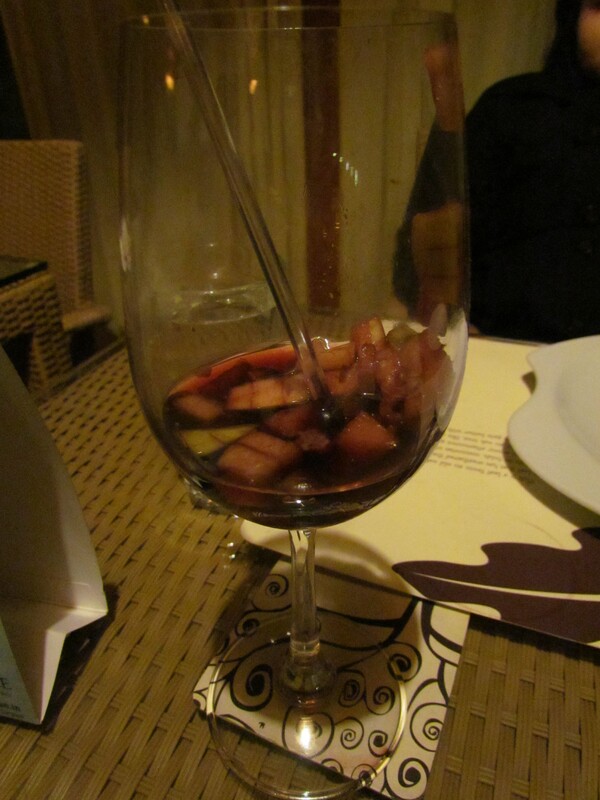 It was not sweet enough & there was no impact of the mix of wine & fruit flavors. This was the first time we had Meads & it was not ‘good’ at all. Overall – The ambience, bratwurst sausage, pizzas & the people make this place special. Good evening outing with a group of friends as well. Other food stuff that we tried cud have been much better.